Safety guardrails lining the roadways around the nation are seriously injuring or killing drivers and passengers who collide with them while in their vehicles. 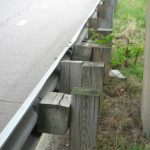 These rails are supposed to protect us from injury by lessening the impact from a collision, or preventing accidents that could send our vehicles over the side of an embankment. Instead, because of a change in their design, they are causing more harm than good for many drivers that come into contact with them. Hundreds and thousands of them exist, and they are deadly. Unfortunately, these rails act more like spears instead of barriers. They slice through cars and the victims inside, instead of protecting them. The manufacturers of the guard rail, Trinity Industries of Texas, admit they have saved money by changing the design of the guardrails. By trying to save a few dollars, the company has changed a safety feature of our roadways into a serious danger to drivers. This week, ABC News reported on the severity of the danger, revealing that theFederal Highway Administration (FHA) is looking into the issue after receiving multiple reports of gruesome accidents and deaths caused by the penetration of the guard rails through vehicles. The problem is found in the design of the end terminals on the rails. They were originally designed with a blunt end that’s intended to absorb shock and give way when hit head-on. The end terminal product gained federal approval in 2000 and is used nationwide. However, Trinity made some changes to this design. Lawsuits allege that Trinity redesigned the rails causing them to impale cars and the people inside of them. Why? This change enabled the company to save on manufacturing costs, and also to make more money in this regard: The rails are now more difficult to reuse after an accident, often forcing highway departments to purchase new ones. Emails from the company that were discovered by ABC state that the manufacturer saved approximately $2 on each terminal, though they deny any motive of profit being involved in the changes. Once again, we see people becoming victims of a manufacturer that has placed profit over public safety. Trinity now faces lawsuits from those who were seriously injured or have lost loved ones due to guard rail collisions. We are on top of the research and studies being conducted on this matter and are eager to assist victims who have suffered serious injury or the death of a loved one caused by guard rails on the roadways. We want to hold manufacturers who place profit above public safety responsible for the lives they’ve shattered. Call the Texas lawyers at Parker Law Firm if you have suffered a serious injury from a safety device related accident.